The concept of precision agriculture utilizes many tools and technologies to identify in-field variability, improve farming practices, and optimize agronomic inputs. Irrigation is a critical agronomic input to maximize yield in many parts of the U.S. However, the uniformity of irrigation application is often overlooked. Thermal image of a clogged nozzle and late irrigation. Aside from malfunction alarms such as low pressure alarms caused by missing nozzles, flat tires, and stuck pivots that can shut down the system, there are few tools to monitor the performance of an irrigation system. Insufficient soil moisture leads to crop water stress and over-heating of plants. When crops are over-heated for extended periods of time, the plant physiology is altered and grain yield is reduced. Proper irrigation scheduling can reduce water stress and mitigate plant heat stress. Malfunctioning irrigation systems and non-uniform irrigation is a problem that may not be detected until spatial patterns are visualized in yield maps. 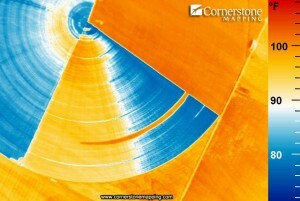 Remote sensing can be used to identify irrigation issues in-season. Irregular irrigation patterns can be detected using true color and color-infrared aerial photography later in the growing season after stresses manifest themselves. However, the plant has already suffered unrecoverable yield loss by that time. New technology is available that can identify irrigation issues several weeks before the symptoms are visually apparent. Thermal cameras can detect heat stress before the plant suffers permanent damage. The latest digital thermal cameras have overcome hurdles of previous generations of thermal detectors. Thermal imaging has not been widely adopted in mapping applications because the spatial resolution and measurement accuracy, until now, were insufficient for practical applications. 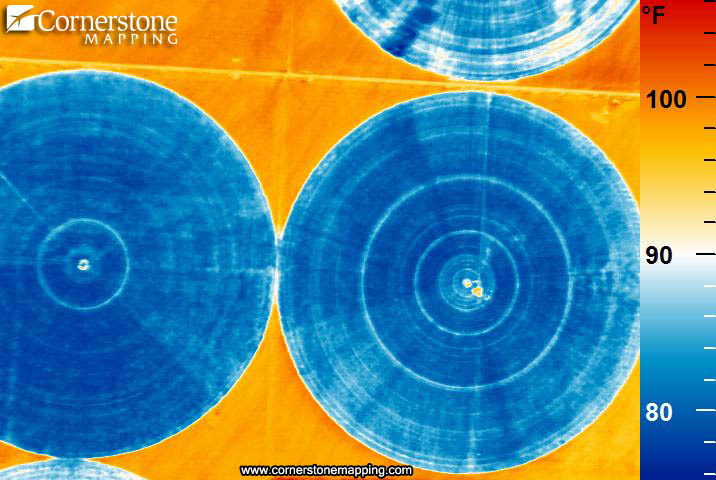 Cornerstone Mapping, Inc. has developed an integrated thermal camera system using a flight navigation system and a tightly coupled Airborne GPS with an Inertial Measurement Unit (IMU) with the Jenoptik thermal camera. The Airborne GPS/IMU enables direct georeferencing of thermal images using exterior orientations (latitude, longitude, altitude, roll, pitch, and yaw) without reference to ground features. The Airborne Thermal Mapper (ATM) is capable of collecting thermal imagery at pre-defined photocenters and delivers an ortho-rectified thermal image mosaic. The ATM mosaic is compatible with most GIS software programs, including those geared specifically toward agriculture. The photogrammetric workflow maintains the radiometric integrity of the original image data. In addition, Cornerstone Mapping’s workflow models the relationship between the camera lens characteristics and the thermal detector. This is a critical procedure that enables production of accurate thermal image mosaics that meet national map accuracy standards. 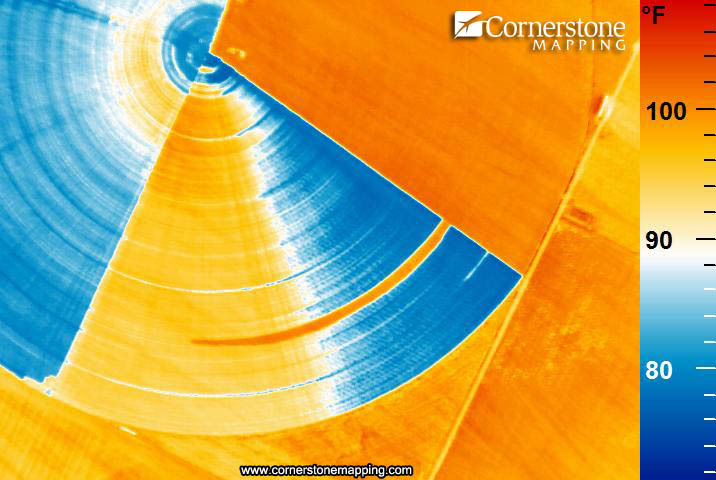 During the 2011 and 2012 growing seasons, Cornerstone Mapping collected dozens of flight hours spanning thousands of agricultural acres. A recurring theme was the ability to detect irrigation related issues with the thermal camera that were not visually apparent with color-infrared remote sensing. Later in the growing season the irrigation issues were pronounced and could be detected in color-infrared aerial photography. However, later in the growing season the crop stress had already caused a yield loss. Ancedotal evidence shows that the thermal imagery can detect insufficient irrigation issues within a few weeks of beginning irrigation. Unpublished research also supports a high correlation (r2=0.95) between early detection of water stress and yield loss, measured by yield monitor data. Light blue rings indicate clogged nozzles. Irrigation issues were detected on center-pivot and gravity-irrigated fields. Irrigation issues on a center-pivot can be nozzle related. The nozzle(s) may be clogged, the pressure regulators might be malfunctioning, the distribution devices within the nozzles could be missing, and a new center-pivot may not be properly nozzled. Early detection of irrigation issues provides the opportunity to correct problems before permanent yield loss occurs. Although this may not be yield limiting issue, a leak in the water supply pipe is also possible. A leak does present an overuse of water resources that does not optimize agronomic inputs. Using knowledge about irrigation systems, crop response, and photo interpretation, thermal imagery is a powerful tool to monitor irrigated crops.